Issue #222: Snapshots – A better way to protect your data? Modern filesystems make it easy to take a snapshot – a precise copy of your data at a moment in time. 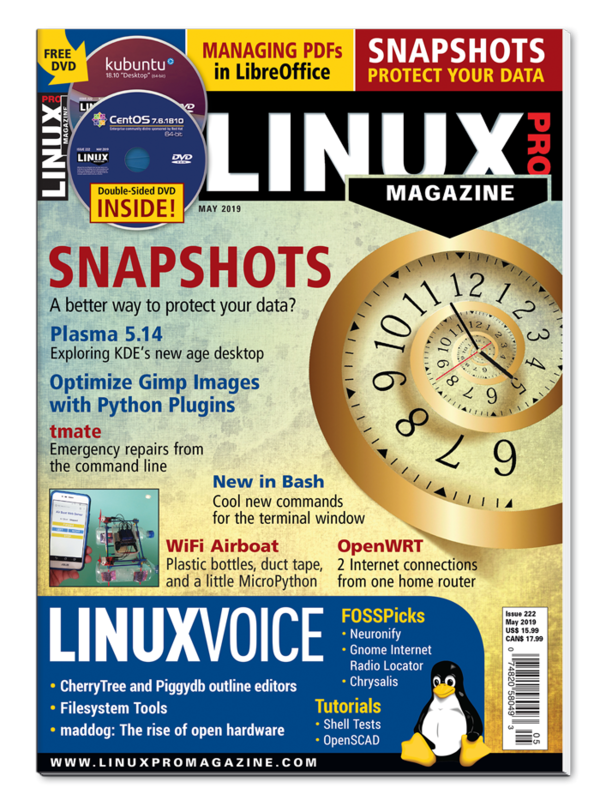 This month we review some leading Linux snapshot tools. * Redundant Internet Links – With a little help from OpenWrt, you can support two Internet uplinks from your little home router. * tmate – Access a remote shell session. * MakerSpace – Build your own WiFi-controlled airboat. * Linux Voice Tutorial – Bash test conditions and a study of two useful outline tools: CherryTree and Piggydb. On the DVD: CentOS 7.6 (1810) and Kubuntu 18.10 "Cosmic Cuttlefish"
* Early Warning for Seismic Events? Experts agree about the need to keep a copy of your data, but restoring from a set of incremental backups takes time and sometimes doesn't work as expected. The other option is to capture your data in a snapshot. We review some leading Linux snapshot tools. Plasma 5.14 brings some highly visible improvements for KDE users, including a much-improved Discover software manager and a new widget for multi-display environments. We tour the latest version of KDE's iconic desktop. Redundant Internet uplinks are standard on big corporate networks, but they are still the exception for the home and small-office sector. If you're ready to experiment, you can set up redundant Internet connections on your own home router with OpenWrt and the powerful Mwan3 extension. As the standard core Linux commands have become more complex due to revisions, new commands have risen to take their place. Bruce looks at seven of these modern shell commands, plus a terminal emulator. Sys admin columnist Charly freely admits that he doesn't like SQL and phpMyAdmin any more than he does COBOL. Meet his new best friend; the slim, attractive database tool known as†Adminer. Performing the same Gimp image processing steps again and again is tiresome and error prone. Mike Schilli assigns this task to a Python script via a†new menu entry. When it comes to open hardware projects, the choice of an Arduino or a Raspberry Pi board can determine success or failure. Read on for guidance in selecting the best board for your needs. Maddog predicts the era of closed, proprietary chips as the only option is drawing to an end. Tools like mount and findmnt reveal which partitions and filesystems are mounted on your†computer. Our shell scripting series continues with a look at test conditions and exit codes. Ah! What a joy is your first 3D printer... but once you have printed your first benchy, where do you go from there? To building your own pieces, of course!